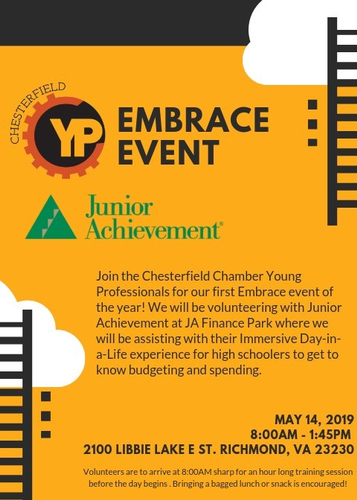 Join the Chesterfield Chamber's Emerging Leaders as we mentor High School students at the Junior Achievement Finance Park on Tuesday, May 14th from 8:00 a.m. to 1:45 p.m.! Get out and get active in your community as we assist Junior Achievement staff in budget and personal finance exercises. This volunteer opportunity is open to Chamber members and the larger community. There is no cost to participate but registration is required so we can give an accurate count to our host. JA Finance Park is a middle and high school program that begins in the classroom and culminates in a visit to the Capital One/JA Finance Park facility. The students' experience begins with thirteen in-class, teacher-led personal finance lessons. The exciting, daylong visit to Capital One/JA Finance Park gives students the opportunity to apply classroom learning by creating a family budget based on hypothetical life situations. Assuming "real-life" personas, students develop a personal budget that includes expenditures for housing, savings, transportation, health care, utilities, education and much more. They recognize the impact of credit history on budget planning and purchasing options. There is no more thorough way to educate young people than by using a practical application of knowledge. Capital One/JA Finance Park gives students the opportunity to combine practical applications with the general principles they have learned in the classroom. The field trip is led by JA staff, but volunteers serve as mentors throughout the day, offering help in decision-making and sharing real-world experiences. Volunteers are needed throughout the year and are provided training on the day of the program. 2100 Libbie Lake E St.
8:00 a.m. to 1:45 p.m.